Our Gynecological Cancer disease group is one of the most comprehensive cancer treatment and research programs of its kind in the country. Recent discoveries in genetics and genomics hold great promise for the development of target-defined prevention and chemotherapeutic strategies for gynecological cancers, including biomarkers development for targeted therapy and immunotherapy. We are investigating early gynecologic carcinogenesis, translating research advances into therapies for prevention and treatment, and testing new therapies in investigator-initiated and multi-institutional clinical trials. Our original discoveries are driving global advances in treatments and cures. Since its inception, our physicians and researchers have successfully fostered scientific interactions between members of the Duke Cancer Institute who have basic, translational, and clinical research interests in gynecologic cancer. The diversity of interests and experimental approaches of our physician-scientists and researchers strengthens our program and brings us closer to understanding gynecologic cancer. 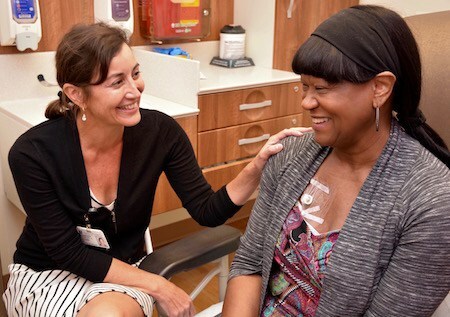 Our multidisciplinary team provides the latest approaches in surgery (including laparoscopic and robotic approaches), chemotherapy, radiation and brachytherapy in a patient-centered environment. We are also leaders in the treatment of hereditary gynecologic cancers. In addition, our program supports developmental projects, new faculty awards, and tissue procurement and banking.